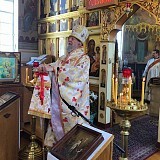 On April 22, the Sunday of the Myrrh-bearing Women, His Grace, Bishop Jerome, paid an archpastoral visit to Holy Virgin Protection Church in Nyack, NY, where he celebrated Divine Liturgy. 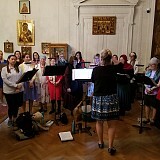 On Saturday, April 21, the eve of the Sunday of the Holy Myrrh-bearing Women, the Holy Myrrhbearers Women’s Choir, renowned throughout the Russian Diaspora and under the direction of Matushka Eugenia Temidis, sang the All-Night Vigil in New York City’s Synodal Cathedral of the Sign for the 21st time in its existence. 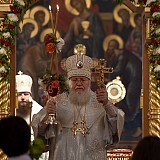 On St. Thomas Sunday, April 15, Metropolitan Hilarion of Eastern America & New York paid his traditional archpastoral visit to Holy Dormition Convent "Novo-Diveevo" in Nanuet, NY, where he celebrated Divine Liturgy in the convent’s main St. Seraphim of Sarov Cathedral. 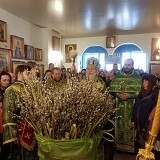 On Bright Saturday, April 14, Eastern American Diocesan vicar Bishop Nicholas of Manhattan paid an archpastoral visit to Holy Annunciation Church in Flushing, NY, where he celebrated Divine Liturgy. 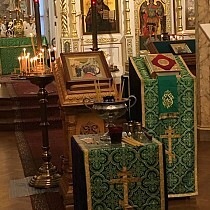 A hierarchal service is usually scheduled each year for the parish’s patronal feast day – April 7. 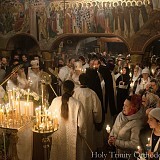 On Saturday, April 7, and Sunday, April 8, the monastic communities of the Eastern American Diocese celebrated the Feast of feast and Triumph of triumphs: Christ’s Glorious Resurrection – Pascha. 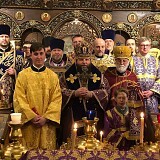 On April 10, Bright Tuesday, the third day of Pascha, Metropolitan Hilarion of Eastern America & New York celebrated Divine Liturgy in Holy Protection Skete in Buena, NJ. 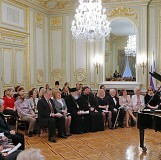 On Thursday, April 12, an official reception was held in the Consulate General of the Russian Federation in New York City, honoring "Russian-American History Month" in the state of New York. 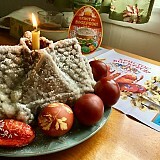 From a heart filled with radiant joy in the Savior Who has risen from the tomb, I greet you all with these life-affirming words and congratulate you on the "feast of feasts" – the Lord’s Pascha. 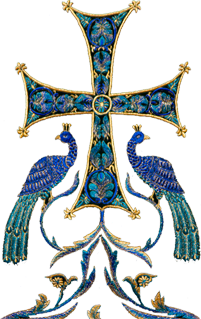 At Great Friday Matins on Thursday evening, Christ’s Church triumphally proclaims the tidings of the sufferings and death of the God-man, divided into 12 Gospel readings, called the Passion Gospels. 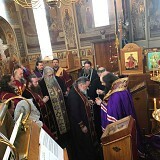 On April 2, an unexpectedly snowy Monday morning, His Grace, Eastern American Diocesan vicar Bishop Nicholas of Manhattan, came to Holy Dormition Convent "Novo-Diveevo" in Nanuet, NY to celebrate the Liturgy of Presanctified Gifts. 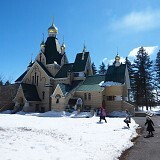 On Saturday the 24th and Sunday the 25th of March, the fifth Sunday of Great Lent, the students, teachers, and parents of the parish school of Holy Virgin Protection Church in Nyack, NY performed a pilgrimage trip to Holy Trinity Monastery in Jordanville, NY. 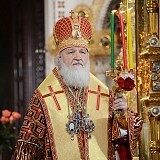 On Sunday, April 1, the great feast of the Entrance of our Lord into Jerusalem (Palm Sunday), Metropolitan Hilarion of Eastern America & New York celebrated Divine Liturgy in the Synodal Cathedral of the Sign in New York City. 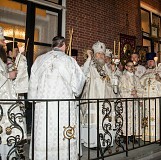 As the radiant feast of the Resurrection of Christ approached, Bishop Nicholas led Lenten divine services in parishes across New York City and State. 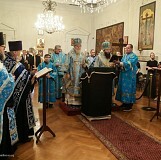 On Friday, March 30 – the eve of Lazarus Saturday – Metropolitan Hilarion of Eastern America & New York paid an archpastoral visit to Holy Dormition Convent "Novo-Diveevo" in Nanuet, NY, and celebrated the Liturgy of the Presanctified Gifts in the convent’s main St. Seraphim Cathedral.